A Ukrainian aircraft was near the downed plane just before it was hit. It seems the earlier reports are true. This is a major shift in the battle for information about the disaster. The Ukrainians refuse to release their air traffic control recordings. 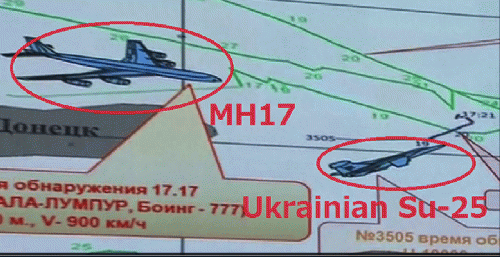 Now, if Russia's presentation is accurate, they've been lying about the presence of their aircraft. Why would they lie? Russia is right next door to Ukraine. Their air tracking and very capable air defense systems are deployed and especially focused given the civil war just over the Russian border. The Russians clearly have the ability to make these claims. The Russians released a significant amount of information in a drawn out press briefing Monday morning. Their move illustrates what some of us refer to as the Russian chess compared to Obama-Kerry checkers (see 3/20). The radar records used to make the point were from civilian sources. The Russians have their military radars but have not released them. Russia asked the United States to release U.S. satellite imagery (the satellite was right over the area where MH17 was attacked). The first Russian move was today's press conference and the data released. They held back the military radar records. The next move is up to Obama-Kerry. Will Obama-Kerry release the satellite imagery? If they don't, the next move by Russia would be a release of the military radar records and another challenge to release the U.S. on satellite releases. If highly respected investigative reporter Robert Parry is right in his July 20, 2014 article, there may be real reason to avoid any such release. "What I've been told by one source, who has provided accurate information on similar matters in the past, is that U.S. intelligence agencies do have detailed satellite images of the likely missile battery that launched the fateful missile, but the battery appears to have been under the control of Ukrainian government troops dressed in what look like Ukrainian uniforms." Robert Parry, ConsortiumNews.com, July 20 also at OpEdNews.Com. Maybe the Russians knew this before Parry did. If not, they certainly knew it before the Monday, 7/21 press conference by simply reading the Parry column. Their move with the extensive military briefing forces the issue on the U.S. - release the satellite images - at a point where they know or see a high probability that the images will inculpate Ukraine's government. That's chess. Are we moving toward check? Are the U.S. satellite images checkmate? President Obama ignored the Russian military presentation. He also ignored the continued military operations by Ukraine in the general area of the crash site. He was well scripted but at some point facts do matter. The following analysis is from Vineyard of the Saker, one of the most active sources of information and analysis on Ukraine. It's brief and to the point. Robert Parry has covered this crisis from the start here, here, and here. Tyler Durden of ZeroHedge has done an extraordinary job of reporting and analysis here, here, and here. The war hysteria generated against Russia regarding the Ukraine follows the same storyline used during the chemical weapons attack in Syria last summer. Obama-Kerry claim the U.S. has undisputable proof that the "bad guys" caused the attack, gear up for serious hostilities, and, when the whole effort falls flat, burry the factual findings that the administration had no basis for its over confidence. From the day of the downing, the propaganda machine cranked up claims that the Ukraine resistance shot down the plane, implied that Russia may have done it, and so forth. The facts may be emerging in real time, rather than much later as they did in Syria.